An ancient evil has returned to Rune-Midgarts. The Dream Demon has trapped our citizens in a waking nightmare. The story begins hundreds of years in the past with the mysterious playwright Cres Wraven in Ragnarok Online and Ragnarok RE:START. 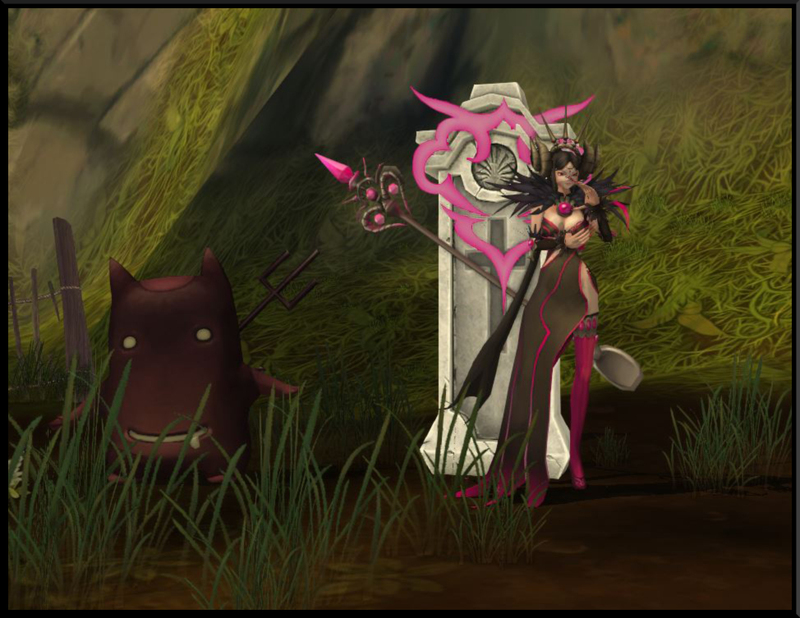 Follow the quest and unlock secret clues that will take you into the future with Ragnarok Online 2. Use the clues from the past and future to complete the quests and earn fantastic rewards for both games! To begin your quest, make your way to Ces Wraven in the Prontera Inn of Ragnarok Online or Ragnarok RE:START. The nightmare will begin in the time of Ragnarok Online, and there you will meet the demon that is haunting your dreams. Once you’ve met the Dream Demon in the past, it is time to use his clues to unlock the story in the future. 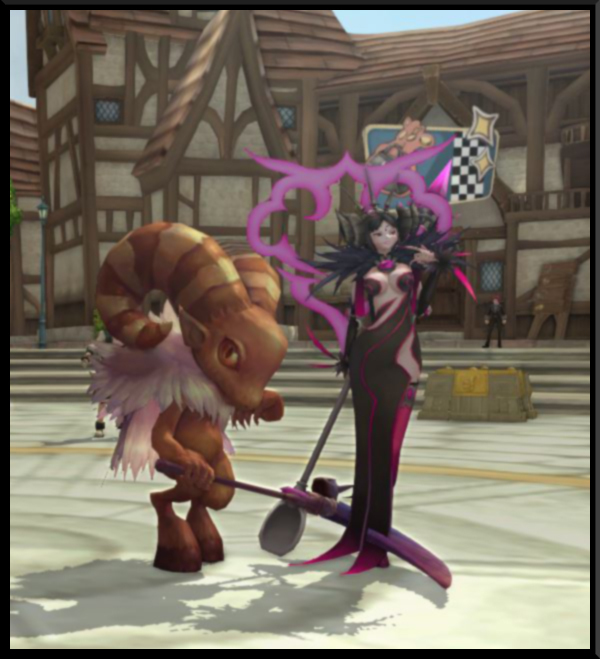 Travel to Ragnarok 2 where a quest will be waiting for you in the Mailbox. Upon accepting this quest, you will be directed toward modern-day Kirkena outside of an Inn in Prontera. Have you fallen asleep? Oh no, you should have listened to our advice. Be sure you have completed the Ragnarok Online or Ragnarok RE:START quest chain before you proceed. After talking to Kirkena you will be ported to Payon Forest and introduced to the Little Devil. Use the clues from the past to unlock the next portion of the quest chain with the Little Devil. If you answer his questions correctly, you will be directed to seek out the Restless Spirits that haunt the Payon Forest graveyard. Pay close attention to the clues the spirits provide you with. You will need them as you move forward. If you choose correctly, you will be provided with an item to summon the Dream Demon. If you succeed, you will be granted the event title of Haunted. Upon completion of this section of the quest chain, Kirkena will discuss the clues with you and direct you to seek answers in your past. To continue, you must pick up where you left off in Ragnaork Online or Ragnarok RE:START. 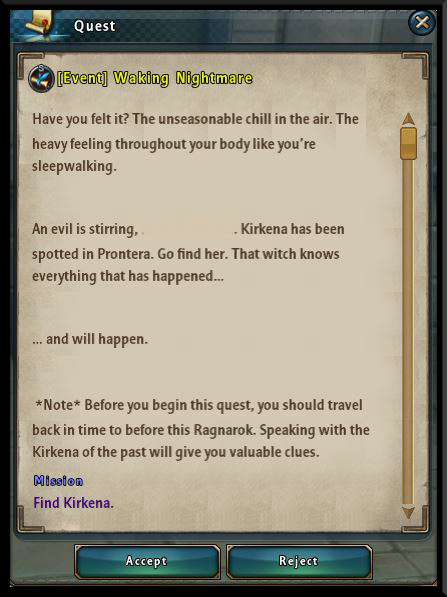 Bring the clues from Ragnarok 2 to Krueg Enna in Ragnarok Online or Ragnarok RE:START. If you successfully complete the quests in the past, you will unlock the experience and item rewards for that game! With the Dream Demon defeated in the past, you can now take Ces Wraven's words of advice with you for one more trip into the future in Ragnarok 2. Meet Kirkena in Prontera to proceed. Kirkena will direct you to battle the demons that are invading the South Plains of Prontera. These demons hold special clues that will help you solve the mystery of the Dream Demon. Retrieve them and return to Kirkena. Use the information from the completed quests in Ragnarok Online or Ragnarok RE:START to decipher the clues. Now that you have unlocked the secrets of the past and the future, you are ready to fight the Dream Demon and his Risen Generals. Proceed to the Event Zone by speaking to Kirkena. Meet her outside of Baphomet's Chamber to face the Demons of your nightmares and seal off the rift that is allowing corruption to leak into Rune-Midgarts. Completing this portion of the quest chain will reward you with the Voidwalker event title and Halloween costume items! You can continue to cleanse the corruption from the world by collecting Seed of Corruption from fallen monsters and returning them to Kirkena's minion, Morningstar, for useful rewards. Enjoy full stats on these titles throughout the event period. Once the event period ends, title stats will be halved. Haunted: Earned after defeating the first major demon of A Nightmare on Prontera Street event. Voidwalker: Earned after completing [Event] Taint Here Anymore. 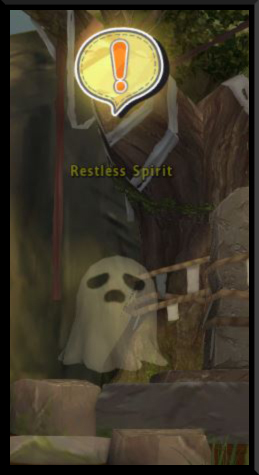 Corrupted Spirit: Collect 100 Corrupt Essence, title item purchasable from Morningstar NPC.